Erma L. Wilkerson, 85 of Mooresville passed away at Meadow Lakes Health Care Center on Friday, November 9, 2018. Born on May 24, 1933 in Marion County, she was the daughter of the late Otis and Rose (Strange) Berry. In Erma’s younger years she worked at various restaurants in the Indianapolis area until joining the Balkamp Company where she worked in the administration of the warehouse. After retirement, Erma and her husband Ralph enjoyed fishing and partaking in the outdoors. Erma attended church at Gosport Methodist and volunteered with the Order of the Eastern Star, Gosport Lodge, where she earned the title of Worthy Matron. Her handcrafted blankets and shawls were meticulously crocheted, a favorite gift she gave to her family. Her pancakes and cookies couldn’t be beat. Erma collected clowns loving their whimsical makeup and costumes. 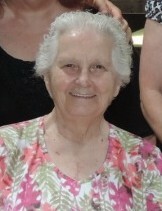 Erma is survived by her loving husband, Ralph Wilkerson of Mooresville; step-children, David Wilkerson and his wife, Karen of Greenwood, Colleen Wilkerson, Peggy Roush and her husband, Eddie, all of Indianapolis and Donald Wilkerson of Mooresville; and grandchildren, Nathan, Natalee, Jon-Michael, Jamie, Sarah, Evan, Cory, and Emily. Funeral services will be held on Wednesday, November 14, 2018 at Chandler Funeral Home-Whitaker Chapel in Gosport at Noon with Pastor Brad Long officiating. Burial is to follow at Gosport Cemetery. Friends may call upon the family at the funeral home on Wednesday from 11:00 a.m. until the time of services. Chandler Funeral Home-Whitaker Chapel in Gosport is assisting with arrangements. In lieu of flowers, the family requests donations be made to the American Heart Association and the American Stroke Association, 3816 Paysphere Circle Chicago, IL 60674.